We were in New York City this past weekend and spent the day at the Museum of Modern Art. This was one of those moments when I'm so glad that I had my camera with me. 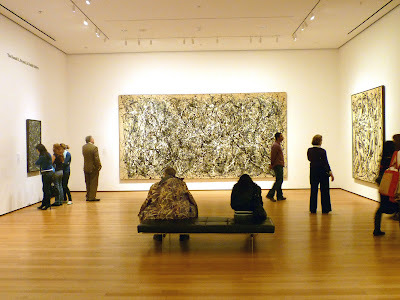 We turned the corner into the Jackson Pollock room and saw this guy who was wearing a camouflage coat that looked just like one of the paintings. Too funny. I imagine him saying to himself "I am so drawn to these paintings, but I don't know why." My good friend Wendy asked me to do this painting of her parents Kenneth and Vivien, otherwise known as KenVi (a la Branjelina, Bennifer, etc ). You may remember I did a painting of Wendy and her new husband on their honeymoon in Spain a few months ago. This photo of KenVi was taken at Wendy's wedding last summer where I had the pleasure of spending the time getting to know them better. Such a warm and generous couple of folks. Her family is meeting up in Florida this weekend and Wendy plans to surprise her parents with this portrait. I am jealous of the warm weather they will be enjoying. Is summer here yet? 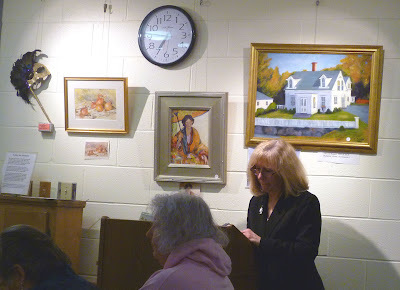 Last Wednesday was the reception and awards presentation for the Foxboro Art Association's show called Masquerade. 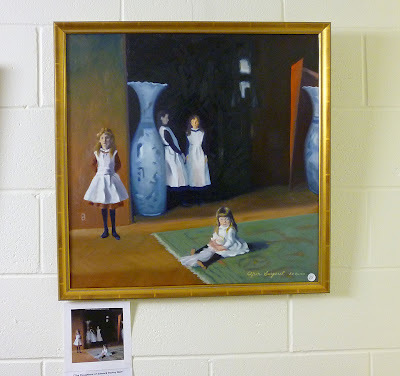 The painting shown above was done by my friend and fellow painter, Frank Quinn. An ambitious undertaking and didn't it come out great? If you look very closely in the bottom left corner, you will see an electical outlet (so clever, Frank!) . Everyone did an amazing job painting their own version of a famous painting or in the style of a famous painter. 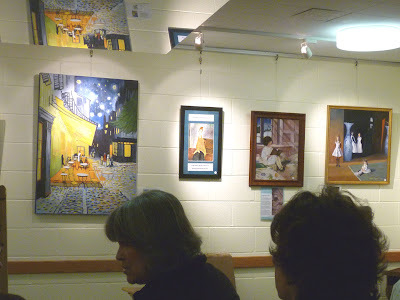 I wanted to show you some of the entries, but the room was very crowded so my photos aren't the best. They will give you a sense of the some of the entries anyway. 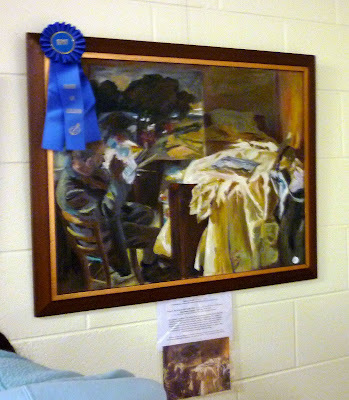 Below is the first place prize winner, painted by Diane Scotti (after Sargent). Really beautifully done. Here is a link that shows my entry, inspired by Mary Cassatt's painting Mother and Child. Everyone enjoyed the show so much, they are talking about making it an an annual event. 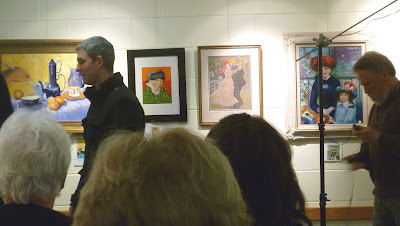 The second part of the meeting was a pastel demonstration by portrait artist, Alain Picard. It was an inspiring presentation and very entertaining as well. How many of us could paint under pressure like that if front of a large group of art critics? His work is simply stunning. 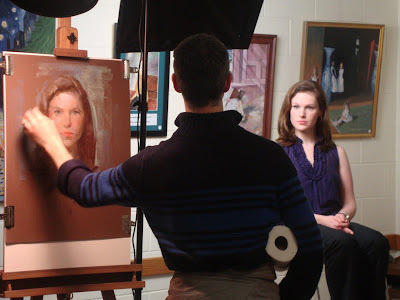 Here is a great shot, taken by Frank, that shows the model and the artist with his painting in progress. I also took this shot of his pastels because he said he got these trays at IKEA for $6 each and he can stack several of them without crushing the pastels. Pretty cool, huh? 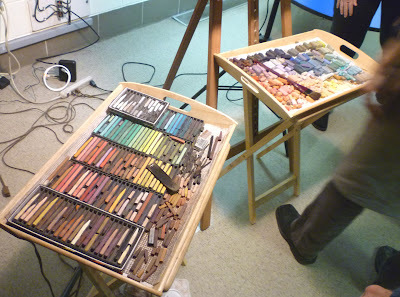 Do you have art supplies or materials that you use that were actually meant to be used for something else? I think that might make an interesting future post–how artists get creative with art supplies and tools. Even better, send me photos and I will post those too. I started off the new year with this painting done in my Thursday night class from a photo reference that was suggested by my art instructor, Kim Morin Weineck. 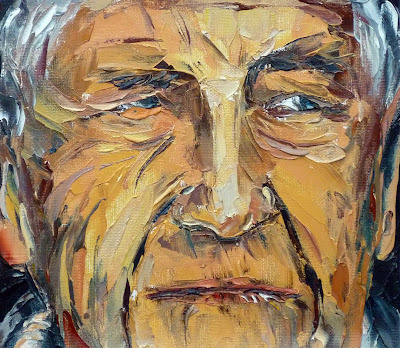 She thought that the wrinkles would provide a great palette knife exercise. She was right. It was also great practice for mixing skin tones. As she noted during critique, my skin tones in the past have tended to be pasty white and chalky, but these came our much warmer and richer. I also have started adding impasto to my colors and like the way it thickens and extends the color without altering it. This is actually a famous artist. Can you guess who it is? These 3 painting were done from some of my family's old photographs. 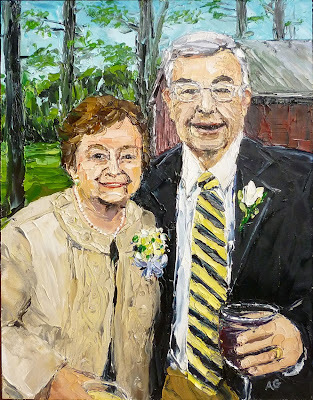 They are currently hanging at Custom Art Framing & Gallery 9 in Norwood and have inspired a few people who have seen them to commission me to do paintings from their own family photos. I mean, don't we all have photos just like this at home somewhere? I have an art show scheduled for the month of June and I'd love your help. I would like to invite you to submit a family photo or two of your own that you think might make a great painting. 1. Please don't send photos taken by a professional photographer. The photo must have been taken by you or someone you know. 5. Email a jpeg image to anngorbett@gmail.com and provide a little info about the image, who is in it, and the approximate date the photo was taken if you know it. 7. By submitting an image, you agree to allow me to use it as inspiration for a painting, choose the composition and the size, exhibit in shows, post on my blog, and offer up for sale. 8. You are by no means required to purchase the painting. 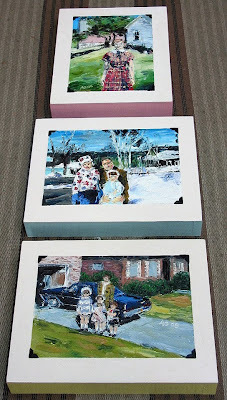 Take a look at my Family Album Series to view previous paintings I have done from family photographs. I am excited to see what you can dig up! Oh, and by the way, my mother, who is in 2 of the 3 paintings above, would have turned 76 today. She shared her birthday with Elvis Presley. I'm sure mom and The King are having fun somewhere today. In my blog side column, I have a Google translation widget which is fun to play with and pretty amazing to see how quickly your words can get translated into other languages. 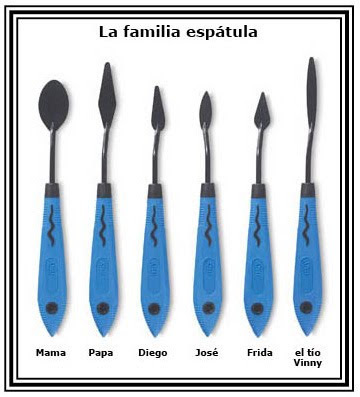 In Spanish, palette knife gets translated to "la espátula". 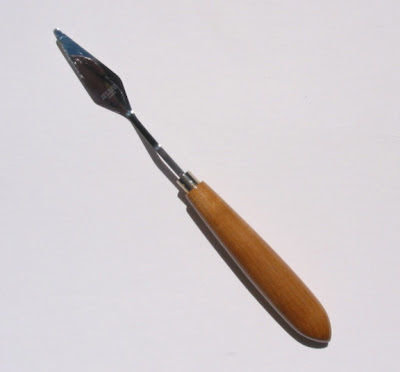 In French, it's "un couteau." What a lovely old port town, very artsy, lots of galleries to visit, interesting restaurants, and wonderful old streets and architecture to explore. We stayed at a hotel that used to be an armory, very quaint and perfect location, right downtown. The next day we visited the Portland Museum of Art and I've included a few photos from our visit. We were very impressed with the museum and it's artwork. While they allowed photos to be taken without a flash, they were very strict about not taking photos of artwork that belonged to a private collection. These were marked with a little icon that I of course missed the meaning of until a nice guard kindly explained it to me. One of our favorite parts was the N.C. Wyeth room. The only painting you could take a photo of is the one below so I also took a close up because the detail on the fish in the boat was incredible. They also had several signs telling you to remain at least 18 inches from the paintings. I happened to catch Polo, ever the rebel, violating that rule. I hope he wasn't breathing too hard. On our way out we noticed these huge apples on the wall down to the cafe. They reminded us of Polo's recent series of apple paintings so we had to get a shot of that. We were surprised to see that when we came out of the museum that the roads and our car were already covered in snow. The ride home was a slow one and we even witnessed a scary spin out and a car being towed out of an embankment. Luckily we made it home safely. Happy Anniversary dear little blog. It was one year ago today that you were born and what a year it's been. Such pride I feel as I clear the list of exhibits and events that I have participated in this past year to make room for new and exciting opportunities in 2010.